After the severe thunderstorm that took place in July there has been concerns from many homeowners regarding their own and the trees of their neighbors. 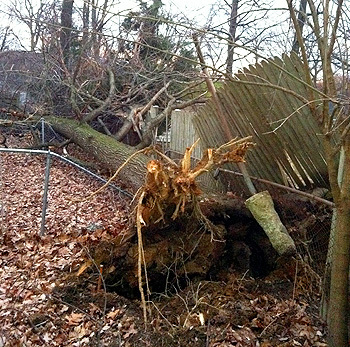 The storm caused a number of trees to fall completely and also left others in a damaged and potentially hazardous state. Northern Virginia Regional Parks: Call the Northern Virginia Regional Park Authority at 703-352-5900, TTY 711. Public school property: Call the Fairfax County Public Schools at 571-423-2350, TTY 711. If the tree is on private property, the property owner is responsible for maintaining their trees. Fairfax County has no authority to force a tree removal on private property unless it is a public hazard. See our article from last year called “My Neighbor’s Tree is Ruining My Driveway“. If the tree is in a conservation easement, you will need contact the Urban Forest Management Division at 703-324-1770 for them to come by and take a look before you do anything.